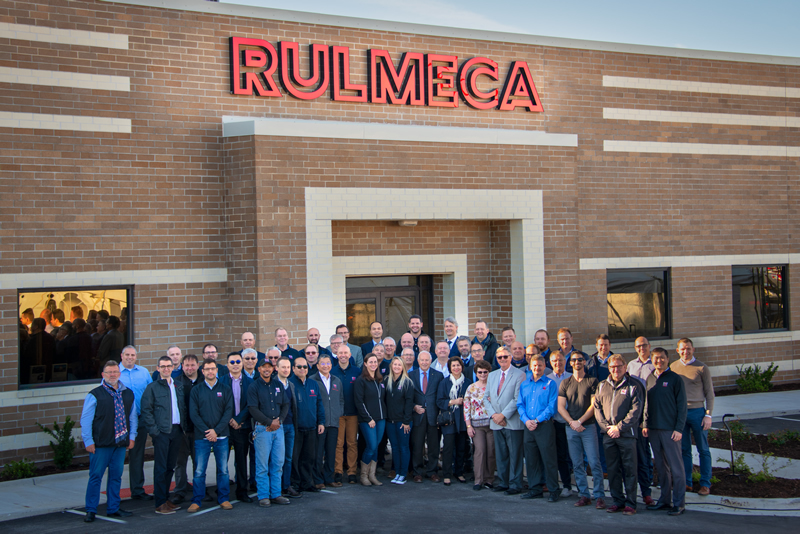 Rulmeca Corporation celebrated the grand opening of our new facility in Wilmington, NC on October 31, 2018 with 40 Rulmeca Group colleagues from 20 different countries. Our group was also joined by other business leaders from the Wilmington area. With a larger space and better access to major transportation routes, the new facility puts us into a good position for continued growth in Motorized Pulley sales and service. Click here to see grand opening video. We started the festivities with a ceremonial ribbon-cutting. Owners of Rulmeca Group, Fabio Ghisalberti (left) and Marco Ghisalberti (right), cut the ribbon while representatives of Rulmeca Corporation, Jay Graham (left) and Mike Gawinski (right), had the honor of holding the ribbon. Prior to enjoying a Southern-Style buffet lunch, our group enjoyed presentations by Rulmeca executives, who congratulated Rulmeca Corporation employees on reaching this milestone while reminiscing on the company’s start-up in 2003. Our grand opening included a “round robin” tour of the facility. This picture shows Jay Graham explaining our Motorized Pulley assembly and testing procedures to one of the four groups of guests. Our inventory of small parts and pulley shells is shown in the background. He also demonstrated how we use infrared spectrometry to predict the performance of our products. Framed by our two 1.5 ton overhead cranes, Charlton Jernigan explains how Rulmeca Corporation produces stainless steel and carbon steel Motorized Pulley shells on our CNC machine. That machine uses colletts and mandrels made by Rulmeca Germany, which enables Rulmeca Corporation to make shells with “one set-up”. Brian Vrablic demonstrates how Rulmeca Corporation uses our new Road Show Trailer to explain Motorized Pulley technology to users of our conveyor drives as well as potential customers. The climate-controlled trailer is taken throughout the US and includes an actual dual drive conveyor as well as touch-screen monitors used to present application stories and technical specifications. The tour included a visit to the conference room, where Mike Gawinski unveiled two new promotional videos. Click here to see The Rulmeca/Jasper Advantage. Click here to see The Rulmeca Advantage.